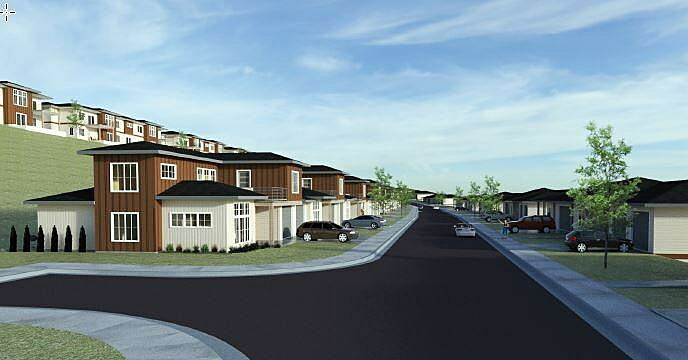 Architect’s rendering of Hillview Crossing townhomes. A proposed 68-townhome development off Hillview Way will be back in a Missoula City Council committee on Jan. 16 as the city, developers and downslope homeowners work through a growing list of concerns. In fact, the city’s Development Services office already has placed 23 conditions on its recommendation for approval of Hillview Crossing. Among the issues: stormwater runoff, which already floods basements in the Wapikiya neighborhood at the base of the hill; traffic on Hillview Way and the safety of children walking from the development to school and play; a tussle with the Human Resource Council over lack of access through Hillview Crossing to a four-acre parcel where HRC wants to build low-income housing; and a perceived lack of compatibility between the high-end townhouses and the older, ranch-style homes in the neighborhoods below. The development consumed about two hours of the Missoula City Council’s marathon five-hour meeting this week, as residents aired lengthy complaints about the plan and both the developer’s representative and city staff answered dozens of questions. Finally, Councilwoman Stacie Anderson, who represents the neighborhood, asked that the planned vote on Hillview Crossing be delayed and the matter be sent back to the council’s Land Use and Planning Committee. That means a Jan. 16 committee discussion. “We only get one chance to do this right,” Anderson said. The project – proposed under Montana’s townhome exemption policies – marks the latest iteration of two earlier proposals for the same property, both of which received City Council approval but never went to construction. Paul Forsting, the developer’s representative with Territorial Landworks, was not altogether happy either on Monday night. In his presentation to the council, Forsting said extra requirements placed on the project by the city will be costly – and will surely drive up the cost of the homes. In particular, he was irked by a required zig-zag trail up the hill required as an alternative pedestrian route to the development rather than walking along busy Hillview Way. The 25-acre project includes 24 attached townhomes resulting in 68 dwelling units, or roughly 2.9 units per acre. The zoning would allow up to 11 units per acre. Still, nearby residents lashed out at the proposal – its density, its aesthetic, its hillside perch. Even without the homes and their attendant streets, Stosich said he is amazed each time a heavy rain fills the streets and a park to overflowing. “And the development will increase that. Homeowner Lori Richard labeled Monday’s presentations by the city and the developer as “sales pitches” and said they were littered with half-truths or outrights falsehoods. “It’s ridiculous to build something that dense on that steep of a slope,” said homeowner Teresa Jacobs.